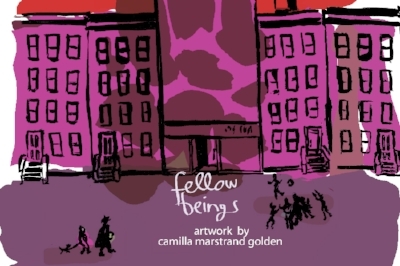 New York, May 13, 2015 to The Grady Alexis Gallery at El Taller Latino Americano is pleased to present Fellow Beings, an exhibition featuring the illustrations of by New York-based visual artist Camilla Marstrand Golden. The works in Fellow Beings reflect relationships that we find when we observe and feel closely as Ms. Marstrand Golden has done. Her meditations on city life are playful, loving and full of the wonder of the unconscious mind, yet her line, grasp of materials and insight are the marks of wisdom, confidence and maturity. Splashes of color lend themselves to emotional tone, light and sound. The energy of her brushstrokes in Sumi ink lends both force and tenderness to her work. Camilla Marstrand Golden is a native of Denmark. Her passion for quality children's literature has led her to join a children's book writers group to better integrate text and illustration. She works as a graphic artist, web designer and art educator in New York City.